How’s everyone doing after Thanksgiving weekend? Raise your hand if you over-indulged… Can you see me waving over here?! Maybe I should use both hands! Because even though I stayed on plan, there was a LOT of rich food on my plate AND I ate a LOT of crossovers (that’s when you mix fats and carbs in the same meal). 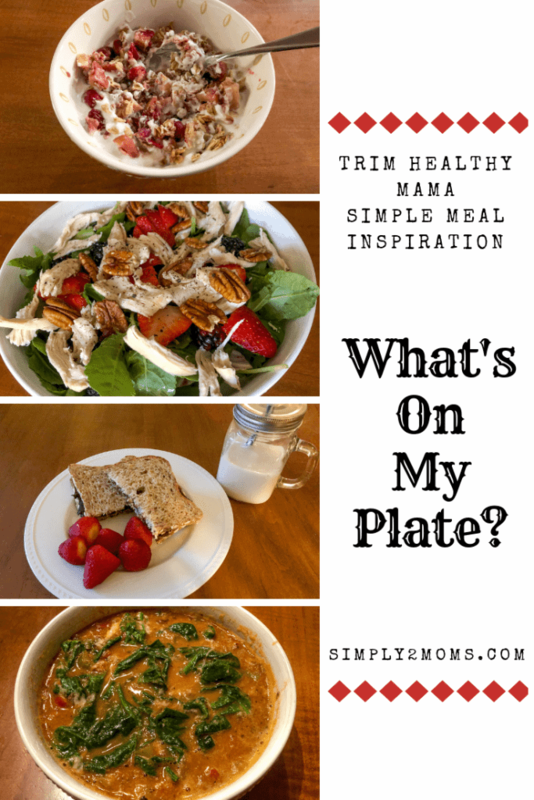 So how about a little trim healthy meal inspiration? After all, it is What’s On My Plate Wednesday! WOMP shackalacka WOMP shackalacka WOMP shackalacka WOMP! These 39 days between Thanksgiving and New Year’s Day can have such a big impact on your waistline if you let them. And that goes both ways! If you’ve been planning to start a healthier lifestyle at the start of the new year, why wait? 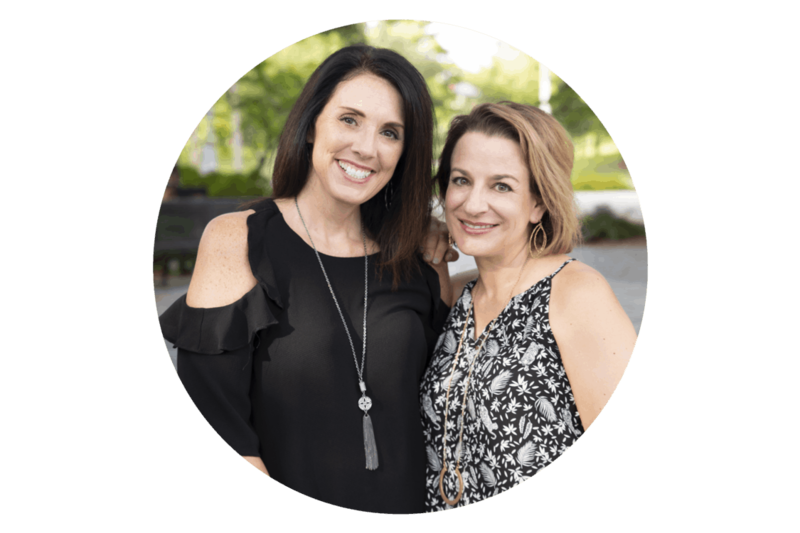 Start making some small trim healthy changes right now and you may find yourself in a better place than before Thanksgiving health-wise! Even a tiny change like separating your fats and carbs for most meals will help. And if you’ve been following a healthy lifestyle already, don’t let a day or two of indulgence begin a backward slide ’til the end of the year. 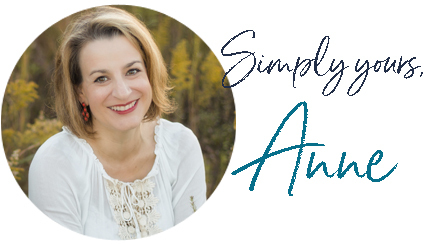 You can find my tips for success during the holiday season here. But back to that trim healthy meal inspiration. 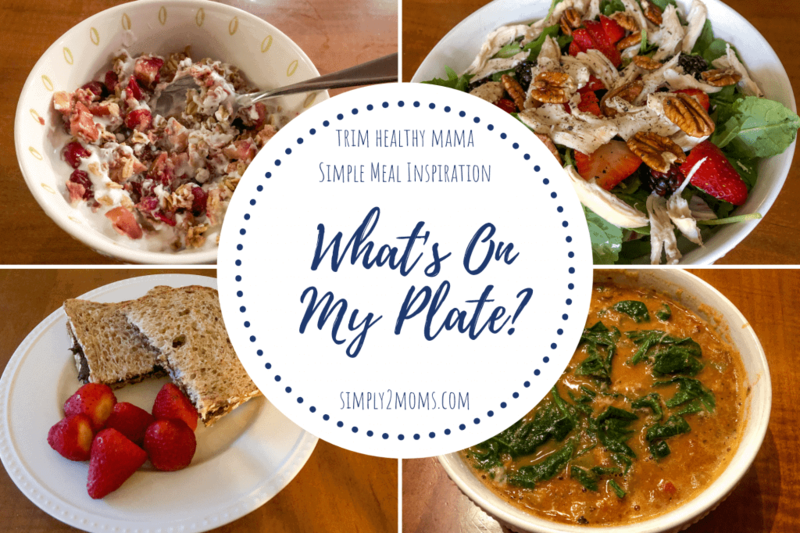 What IS that food on my plates? I have a way of making too much food any time I entertain. Anyone else do that too?! It starts off with me planning too many options because there are so many awesome recipes out there. And then, a day or two beforehand I begin to panic. What if I don’t have enough?! Or what if I left out a special dish that one of my guests really enjoys? One of my favorite things to do with the leftover crumble is to mix it with plain, nonfat Greek yogurt. I don’t add any sweetener to the yogurt because the crumble is plenty sweet on its own. 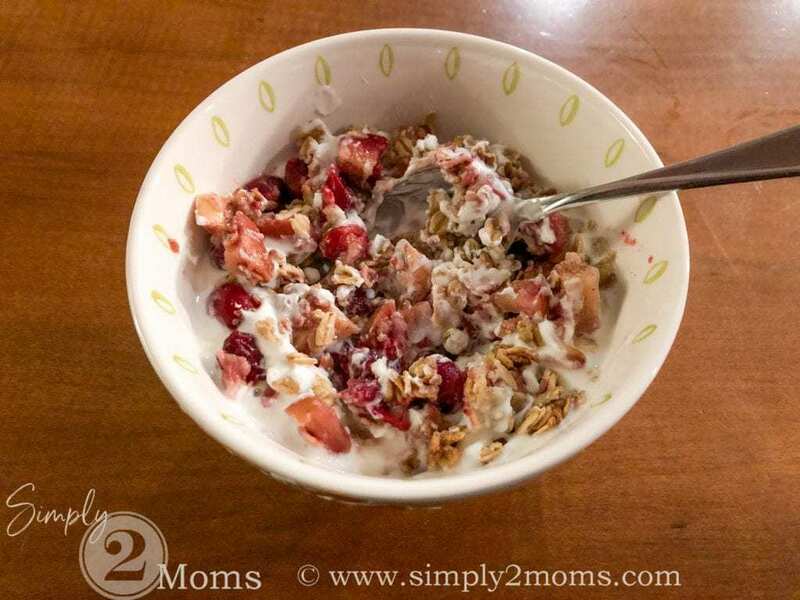 It makes a delicious E breakfast or snack! This is an E meal because of the carbs in the oats and apples. There’s virtually no fat, and the Greek yogurt adds a lot of protein. Thanksgiving leftovers don’t have to mean more plates filled with heavy, indulgent food! Sure, I had some of those too, but a salad is a great way to use up some leftover turkey. 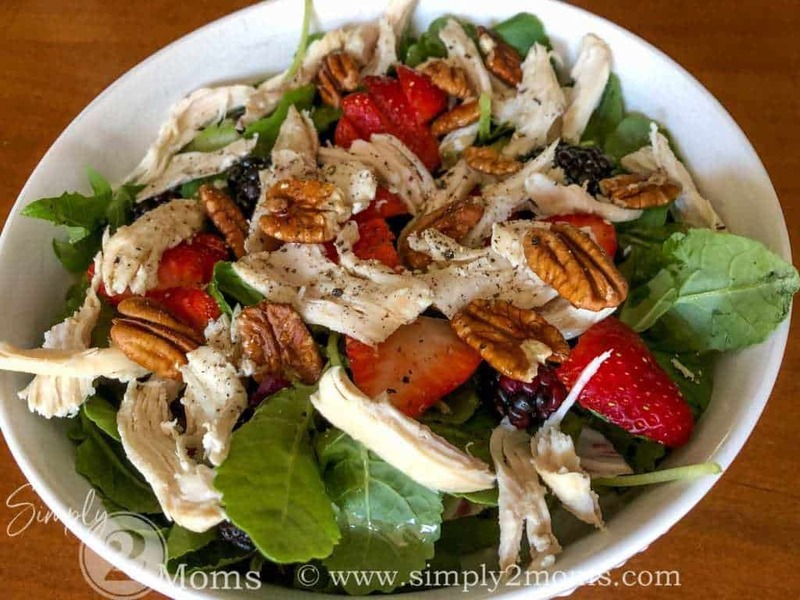 This salad had about 4 cups of baby kale, and I topped it with some fresh berries, pecans and turkey. A generous drizzle of MCT oil, and a Tablespoon of Sicilian Lemon White Balsamic vinegar were the perfect dressing. If you’ve never tried flavor infused white balsamic vinegar, I can’t recommend it enough! You may want to check and see if you have a specialty olive oil shop near where you live or you can order it from the link above. The best part of those shops is getting to taste all the different flavors, so go check one out if there’s one close to you! This meal is an S meal because of the fat from the MCT oil and the pecans. After all the cheesecake I had over the weekend, this healthy salad felt so good to eat! 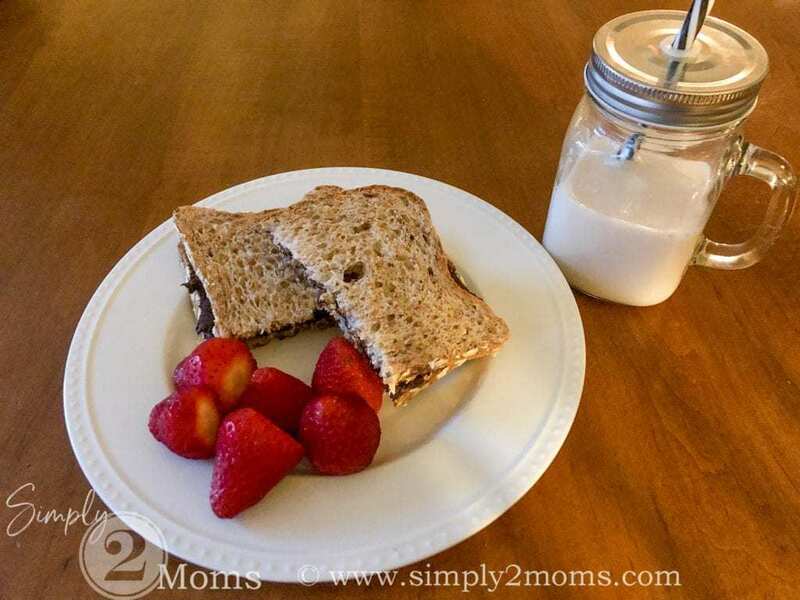 On days when my kids are at school, my meal times are a little crazy. I finish my breakfast at 7:30, so I tend to eat lunch at 11. And if I finish lunch at 11, I’m ready for a snack by 2-2:30. Sometimes I just have a light snack, and sometimes that snack is more like a second lunch! This was one of those days! Who doesn’t love a peanut butter sandwich? Thanks to de-fatted peanut flour it’s possible to enjoy one as an E meal instead of a crossover (XO)! Okay. So this picture doesn’t do this soup justice. 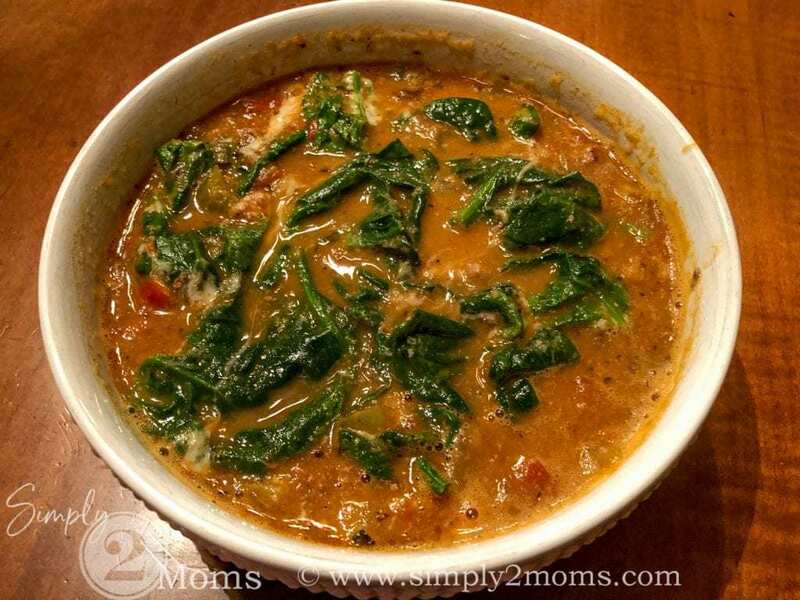 This is the Pizzeria Tomato Soup from the Trim Healthy Table cookbook. It’s a delicious, thick tomato soup with all sorts of pizza toppings mixed in! You can really let your taste buds be your guide when you make this soup. I added green pepper, onion, pepperoni and Italian sausage to this pot. Sometimes I serve this soup with a side salad, but I didn’t really feel like having another salad. So instead I added a bunch of steamed baby spinach to my bowl. My family had side salads with theirs. What’s not in the picture because they were still in the oven when I snapped it are some of my Easy Garlic Biscuits. These little cheesy biscuits are the perfect thing to go with this soup! If you haven’t tried them yet, well, why not?!? Seriously, though, you will love them. 😍 I promise! This is an S meal because of the fat in the pepperoni and Italian sausage in the soup, and the cheese and butter in the biscuits. And that’s it for my day of plates! We finished dinner around 7 p.m. and I was in bed by 10 (I am NOT a night owl most nights!! ), so no snacks after dinner for me. 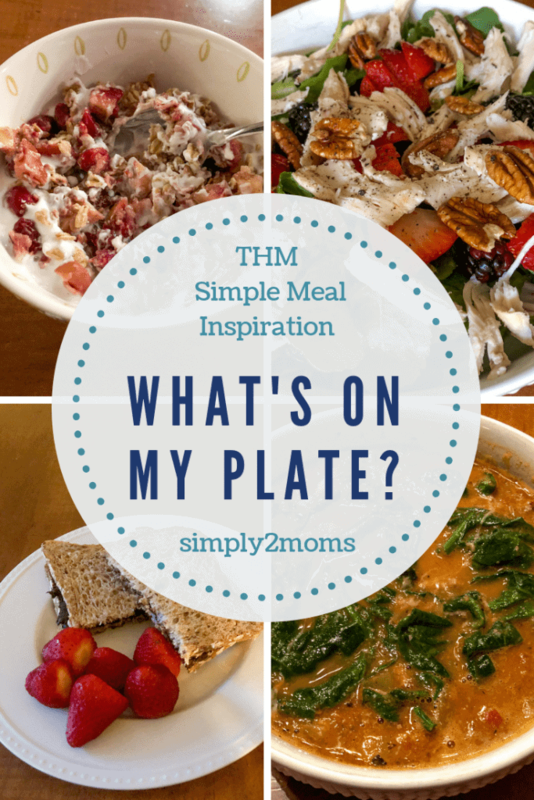 I’d love to know which meal inspired you most? Let me know in the comments! 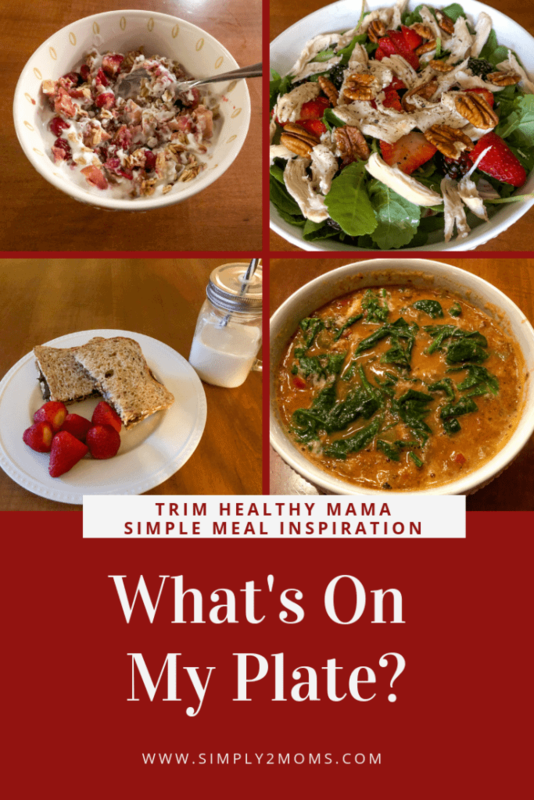 You can find all our What’s On My Plate posts here for more than 2 weeks of meal inspiration!